Send more than a card this year with this beautifully elegant custom Hanukkah wishes card from Pinhole Press. 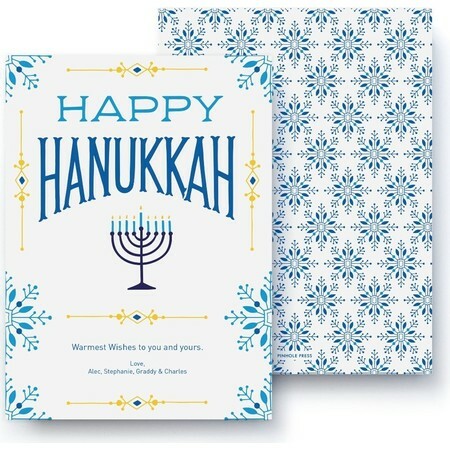 If you want to send blessings and joy to your beloved family members and friends and reconnect with those you've lost touch with over time, this Hanukkah wishes card is the perfect way to do it. Designed by acclaimed artist Clairice Gifford, our Hanukkah wishes card symbolizes the true meaning of the season and as well as the love for the most important people in your life. Our Hanukkah wishes cards measure 5.125 inches by 7 inches and are printed on ultra white premium paper that makes a lasting impression. Superfine ultra white, eggshell finish envelopes are included for an added touch of style and elegance. Customize your greeting with the warmest of wishes for your friends and family. Isn't Hanukkah the perfect time of year to let those you love know how much they mean to you?